You may register for individual online classes or our full certification course (online or onsite) by clicking below or, better yet, call us at +1-805-640-9798 so that we may assist you with your enrollment process and answer any questions you may have. 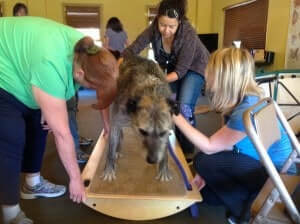 Our onsite canine massage certification course is offered once every year. The onsite portion of this course is 13 1/2 days in duration with one day off midway through the course. This course has no prerequisites. The student must have previous experience in handling canines. You need no prior knowledge of massage to take this course and succeed in the canine massage field. Description- This program is focused on therapeutic massage which requires a working knowledge of the dogs anatomy, physiology, common pathological conditions, gait/conformation, nutrition, and behavior. The 150-hour home study portion of our onsite course includes 50 hours of anatomy and physiology. Although not required prior to coming onsite, we highly recommend that students prepare for the onsite class by completing the first three lessons (at a minimum) of the online course. Online lessons 9, 10 and 11 are required as a part of your On-Site course requirement and must be completed in order to receive your certificate of completion. All students attending the onsite course, in full, will receive the online course (lessons 1-12) at no additional cost. Payment is due prior to receiving any online lessons. You will be charged only the tuition for the onsite course when both courses are taken. Provide students with a well rounded education so that they can succeed in the business of canine massage. To prepare the layperson, who just wants to learn more about their dog, learn how to apply professional canine massage techniques on their dog. Introduce specific canine massage techniques designed to ward off stress & illness, improve flexibility, and promote you and your animal companions overall health. Gain a new skill or complement your current work with canine massage. Experience the transformative effects of healing massage, for both you and your canine friends, and enhance the powerful bond between you. Assess and understand how proper nutrition relates to various health conditions and how to choose the correct diet for a specific dog. Help your canine companion, and other dogs, to live a balanced and healthful life and ensure their liveliness and longevity. Our program schedule may be viewed on our website calendar or please call us for more information. Canine Massage- 126 hours: Covers Swedish Massage for dogs, Myofascial Release for dogs, Trigger Point Therapy for dogs, Acupressure for dogs, TTouch for dogs, and Passive Stretching for dogs. Proper charting techniques for the professional canine massage therapist will also be covered in this class. Canine Thermotherapy- 4 hours: Covers indications and contraindications for hydrotherapy, application of hot and cold packs, cryotherapy and commercially available therapy packs. **This is not an aquatic therapy class. If you are looking for a swim therapy, or a canine aquatic therapy class, then please check with the IAAMB. Canine Gait Analysis- 4 hours: Covers canine locomotion, structural analysis, conformation of the dog, video taping of canine gaiting patterns and correct charting. Canine Safety, Hygiene and Handling- 4 hours: Covers the basics of safe handling, simple training techniques, identification of animal behavior patterns and canine communication signals. Palpation- 10 hours: Students will learn to palpate the major boney landmarks and trace the major muscles of the body. Students will also learn acupressure meridians and basic treatment point location. Canine Anatomy- 40 hours: Covers canine skeletal and canine muscular anatomy. Students will learn the names of all the bones in the animals body, major boney landmarks and the major muscles of the body including their origins, insertions and actions. Canine Physiology- 30 hours: Students will learn the functions of the 11 systems of the body as well as the basics of animal nutrition. Canine Pathology- 10 hours: Students will learn about the top 10 canine and feline pathologies and how to identify the signs and symptoms of these pathologies. Zoonoses and communicable diseases will also be covered in this class. Canine First Aid- 2 hours: Covers common first aid procedures for animals. Business Development- 10 hours: Students will develop a business plan and learn how to market their canine massage services. You will leave this class with your business and marketing plan in hand, along with your business card design and gift certificates. 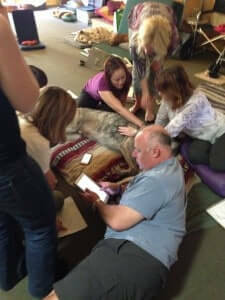 You will learn how to develop a successful business in the field of Canine Massage. Case Studies- 10 hours: Students will complete 10 hours of fully charted independent case studies on, at least, three different dogs that are not their own; so that you will know how to correctly document your dog massage sessions and to start working with dogs that are not your own . Please click on links below to order. Please allow time for shipping (lesson one of the online course does not require a textbook). One of your assignments will be to “color-in” the Dog Anatomy: A Coloring Atlas, so please do not buy this book used. There is an ebook option for two of the books as well. 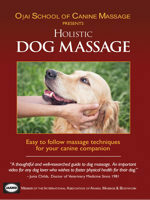 You can Download the Holistic Dog Massage video or purchase a hard copy of the DVD through Amazon. 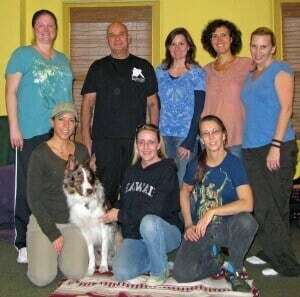 Holistic Dog Massage Video – Download Video or Purchase DVD here. Students may register and pay in advance for the full Onsite Canine Massage Course. You can purchase any of our course material directly on our website. You will need to fill out the required enrollment and registration forms before purchasing the course. You will automatically be sent Online Course lessons 1-12 when paying in full for the Onsite Canine Massage course. If paying by check, please call us to arrange a payment schedule. Tuition is due in full by the first day of the onsite class. During the course, there are open book online quizzes for Anatomy and Physiology. Online quizzes are not timed and can be taken more than once. There are no required internships or externships in this class. **THERE IS NO CALIFORNIA STATE LICENSURE REQUIREMENT FOR THE SMALL ANIMAL MASSAGE PROGRAM. Students completing all program requirements will receive a certificate of completion from the Ojai School of Canine Massage. Ojai School of Canine Massage is approved by the International Association of Animal Massage & Bodywork/Association of Canine Water Therapy as an Approved Preferred Educational Provider. 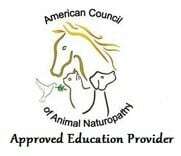 We are also an Approved Education Provider by the American Council of Animal Naturopathy. We are a member of the NBCAAM and are approved by the BPPE as an exempt institution.